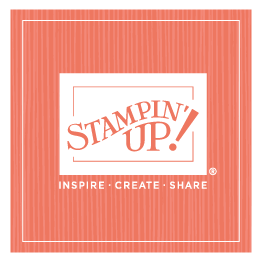 A couple of weeks ago, Amy Swartz, our vice president of marketing at Stampin' Up!, showed me some projects she was creating for her son Giacomo's upcoming birthday. I fell in love with them, and asked her to guest blog and share her creations with us once the party was over. I love an excuse for a party. And a party with a great theme that runs through every element of the party is even better! So months prior to the big event, I started thinking about what the perfect theme for Giacomo’s 2nd birthday party might be. Luckily, the first theme that came to mind--Noah's ark--was a winner. So the next step was the invitation. To make the ark, I used the Wild About You stamp set, the striped paper in the Parisian Breeze Specialty Designer Series Paper pack, Chocolate Chip and Close to Cocoa textured card stock, Antique Brass Jumbo Eyelets, and (discontinued…sorry!) Chocolate Chip felt ribbon from the Ribbon Originals. Giacomo loves animals – all animals—so Noah had many types of animals on his ark. I used every animal in the Wild About You set and rotated them on the individual invitations. 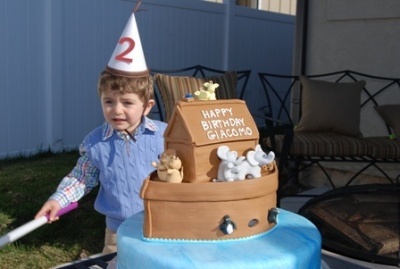 And because Giacomo was turning two, there had to be two of each animal, plus no naked envelopes! Once the invitations were in the mail, I started work on the decorations and party favors. I created a banner, party hats, and personalized name tags. Parents were also invited, so there had to be a little something for them. I just had to do something else with the ark used for the invitations, so I came up with a little mobile that hung above the fabulous Noah’s Ark cake (which I did not make!). And Noah was kind enough to let one of his pony’s come to the birthday party too!